Avira PC Cleaner is a free malware removal tool that helps to detect and remove malware from PC. It can be used as secondary security tool for your PC, so that you can ensure more security. It provides a quick scan and full scan option that starts scanning PC hard drives and provide you results. After completing the scanning, total number of threats will be visible to you, as shown in screenshot below. To delete the detected malware, just a single click is needed, and it will remove all threats. You can use Avira PC Cleaner along with any antivirus software for extra protection. It is a beneficial malware removal tool, but you must keep antivirus installed on your PC for overall protection. Note: When I started testing this software, it did not show me any malware, thanks to my antivirus. So, I had to specifically find and download malware on my PC to see if Avira PC Cleaner is able to detect that. And it did. 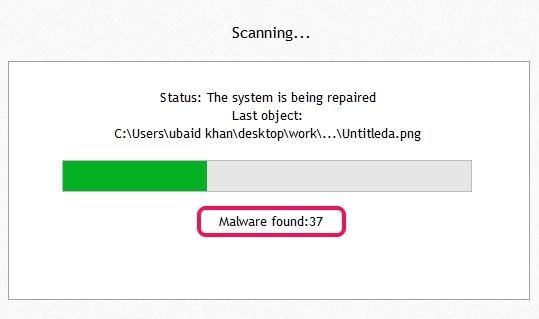 A handy malware removal utility that can scan whole PC to detect threats. Quick and full scan options are available. Full scanning will take a long time and makes your PC slow as well. But full scanning is really useful to do a more thorough scan for threats. It shows summary to view total number of scanned files, directories, threats detection, and total number of removed files. One click malware removal facility. Lightweight software. Just 2.17 MB in size. How To Use This Free Malware Removal Tool To Secure Your PC? You need to download this freeware and double-click its executable application file to open its interface. Its download link is present at the end of this review. It is available in German and English. You can use English option to download its English version. While running it for the first time, it will create a temporary folder where all required files will be downloaded (one time only). Also two different desktop shortcuts will be created on your desktop: Avira PC Cleaner and Remove Avira PC Cleaner. Use Avira PC Cleaner icon to open its interface. Its interface provides Scan System button to start scanning the PC and Full Scan option that can be enabled for deep scanning. It will make your PC slow but will do thorough scanning. During the scanning, it will show you real-time detection for total number of malware found so far. Once the scanning will be completed, result will be in front of you. To remove found threats, use Remove All button, and all threats will be removed from PC shortly. A summary for quick view of total number of scanned files, removed files, etc. can also be viewed. Similar free malware removal tool covered by us: 9-Lab Removal Tool, Combofix, ERA Remover, and FreeFixer. 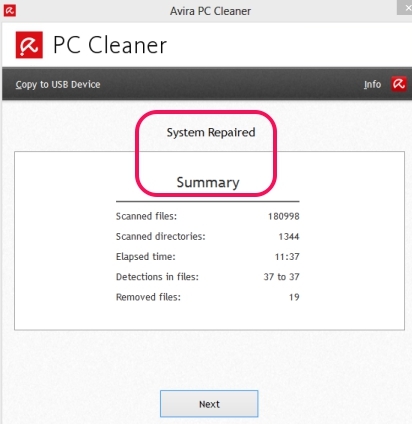 As a second line of defense, Avira PC Cleaner does its work quite well. If you think, there are some malware available on your PC that are not detected by your antivirus, then this malware removal tool could be helpful for you to clear your doubt. Get Avira PC Cleaner free.